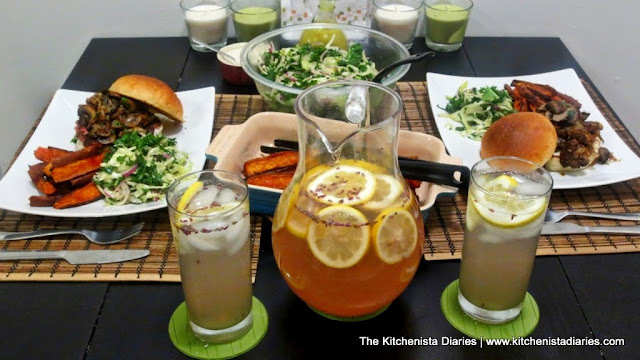 Ready to wow everybody at the next bbq or summer picnic? Try this amazing slaw recipe instead of the usual plain-Jane mayonnaise based coleslaw. Let's be honest folks. Coleslaw is usually something that's just there because it's supposed to be, right next to the potato salad and chips. You're lucky if it's homemade, let alone from actual fresh shredded cabbage. By the end of the bbq, it becomes a watery rancid mess of soggy cabbage. Yuck. I never really understood the concept of taking foods dressed in mayo to summer outdoor events anyway. I'm always a little paranoid about food safety when it comes to parties and potluck meals. Anyway, this salad is mayo-free and full of healthy veggies that stay crisp for a couple days. 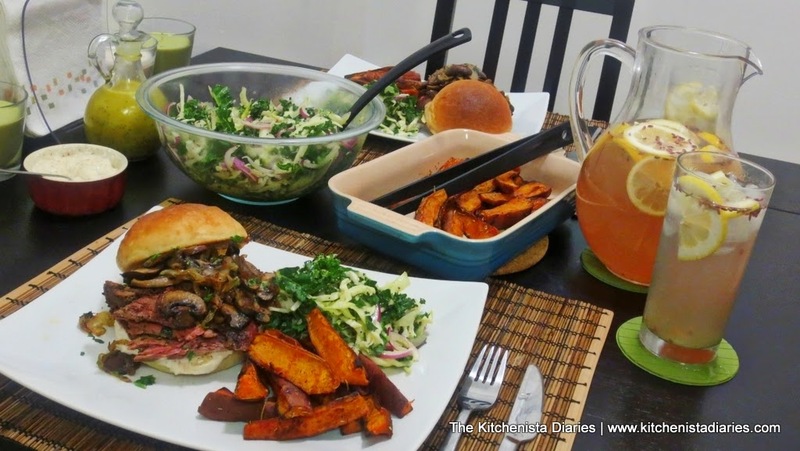 I served my Kale & Fennel Slaw alongside steak and mushroom sandwiches (on homemade brioche buns, thank you) for a delicious Memorial Day weekend dinner. By the way, when you're done here, be sure to head on over to Thug Kitchen for a delicious Lavender Lemonade recipe. I know what you're thinking...raw kale? I will admit, I was skeptical. I accidentally tried raw kale from the salad bar once and damn near choked to death, so I've been afraid of it ever since. But trust me on this one. Put that bag of Glory Foods Chopped Kale away and start with fresh, organic kale. It is more fragrant and tender than anything you'll get in a bag. Sweet red onions bring a nice pop of color to this dish, but vidalia will do in a pinch. Stick to mild sweet onions that won't overwhelm the other ingredients. Fennel adds a nice crunch with an unexpected bright, yet subtle licorice-y note that complements the bitter kale and sweet dressing. Buy a bulb to use for this salad and save the other half to roast for dinner another day. 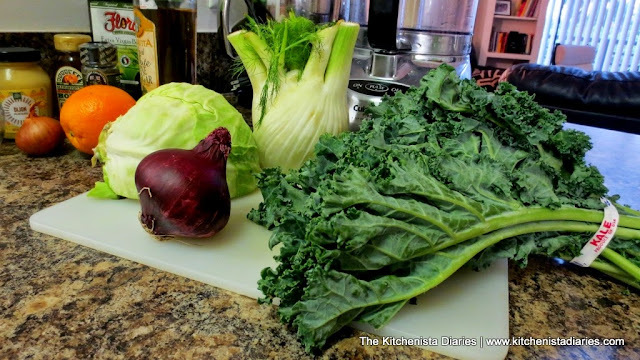 Green cabbage is ridiculously cheap and is definitely a staple worth introducing to your kitchen. A whole head costs mere pennies and will stretch across several meals. And this dressing? Listen. You won't even miss the mayo. If you haven't started making your own salad dressings,you'll want to get on board ASAP. Way too many sugars, bad oils, and unpronounceable chemical ingredients in the average store bought dressing for me to bother with them anymore. Most salad dressings can easily be made using ingredients you likely already have in your pantry. The Orange Poppy Seed Dressing is fabulous! I've been drizzling it over my mixed greens and spinach leaves all week. Vegan? No worries. Just substitute Agave or the sweetener of your choice for the honey. 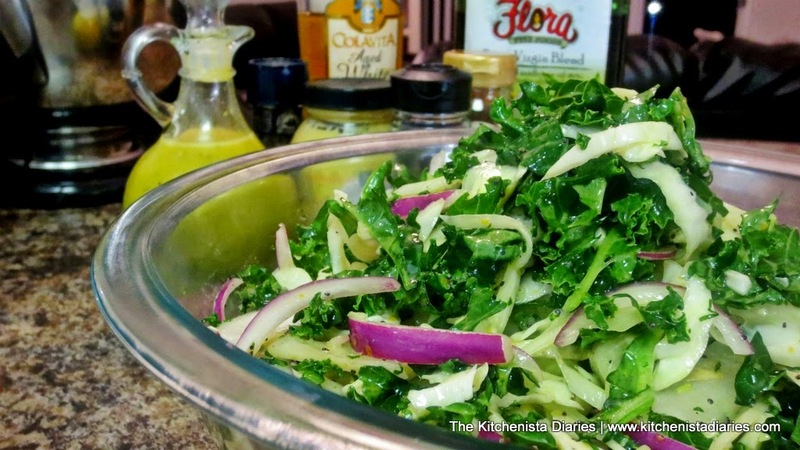 I'm pretty sure this Kale & Fennel Slaw will slay the carton of deli coleslaw your Auntie picked up from the store. It might even make you want to skip the potato salad. It's that damn good. 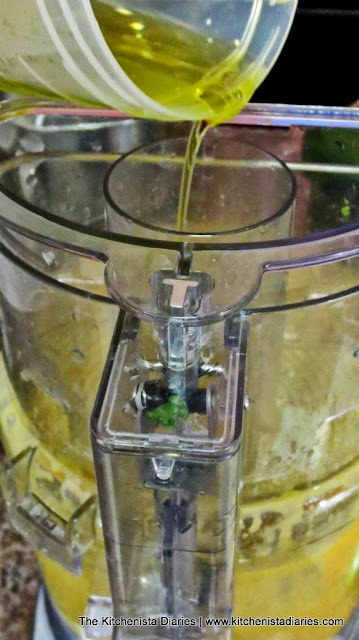 Equipment Needed: A food processor or mandolin will save your life here, but it can also all be done by hand with a good knife and wire whisk. First things first. 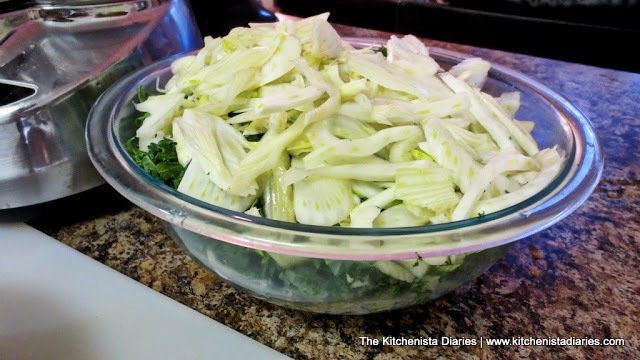 Using your food processor, mandolin or knife, shred the cabbage and thinly slice the fennel bulb. You'll want to remove the cores from both first. You can use your shredder attachment of the food processor for the kale as well, or just finely chop it up with a knife. Be sure to cut off all the stems before shredding it. We really want to minimize the pungency of our onions. 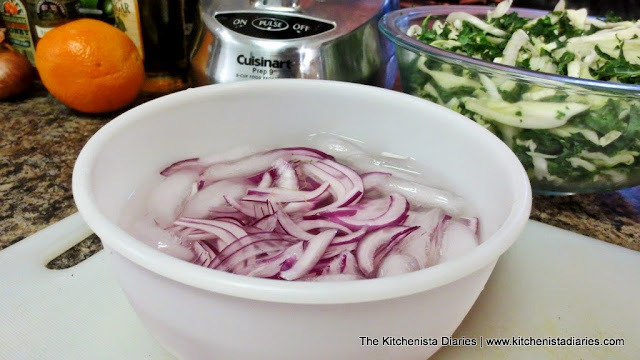 Even though they are sweet red onions, they still have the potential to overpower a dish when raw. I've taken to soaking my slices in an ice bath while I prep my other ingredients. Season the kale, cabbage and fennel with a good couple pinches of kosher salt and plenty of cracked black pepper. I gave this a good splash of white wine vinegar too. 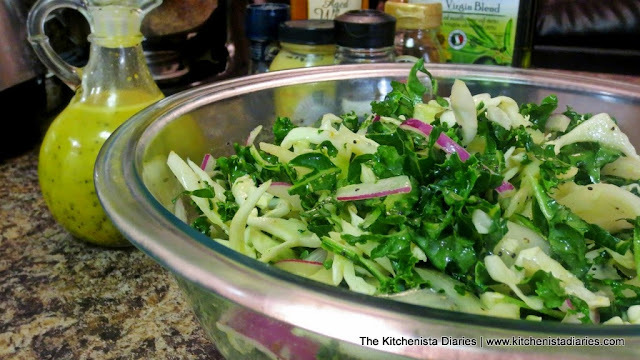 Toss and set aside while you prepare the dressing. 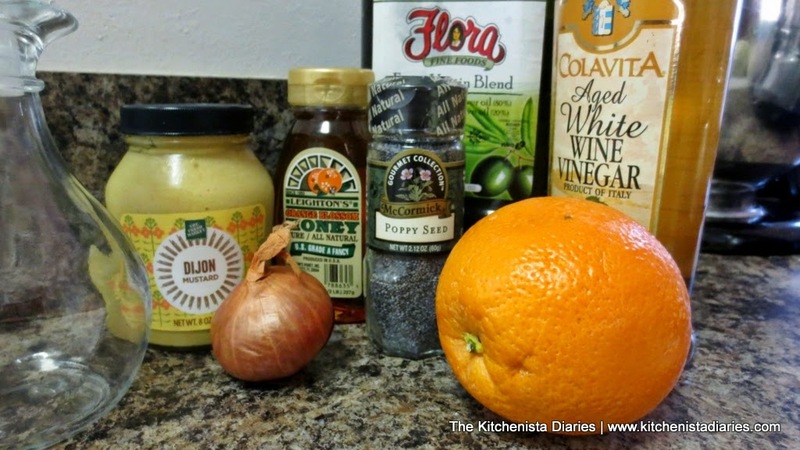 Start off the Orange Poppy Seed Dressing by zesting and juicing the whole orange. It's really important to stick to organic citrus fruits when you plan to eat the peel. 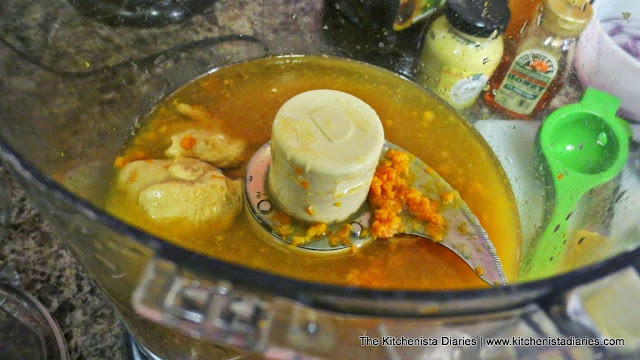 Add the dijon mustard, honey and white wine vinegar and then turn on the food processor. With the lid on, slowly drizzle the oil through the tube feed. 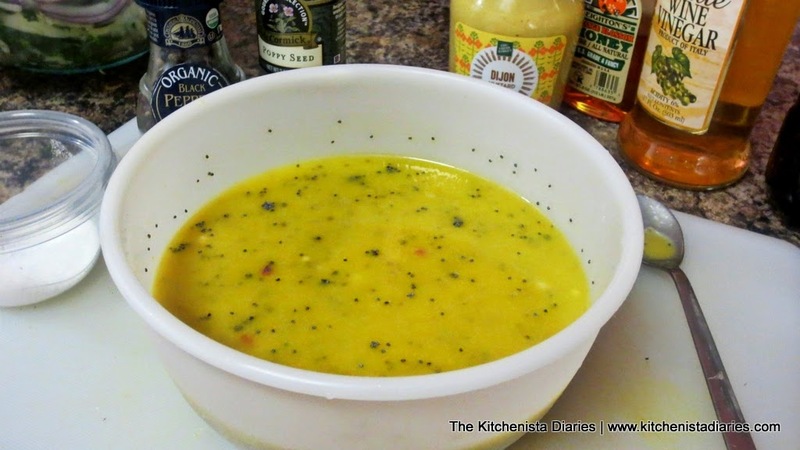 At around 1/2 cup, give or take, your dressing should be emulsified and slightly creamy. Finely chop up some shallots. If you absolutely had to substitute something here, a minced garlic clove will do. 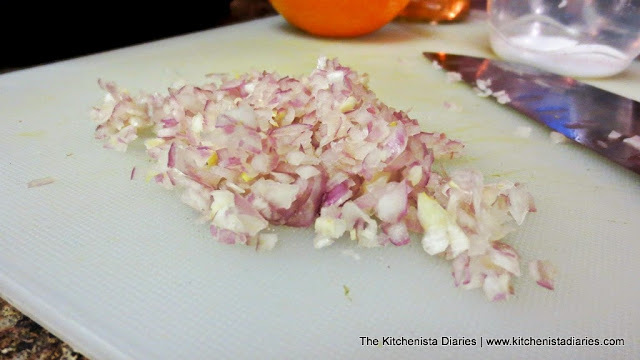 Shallots add a nice mellow flavor that seems to meet halfway between garlic and onions. 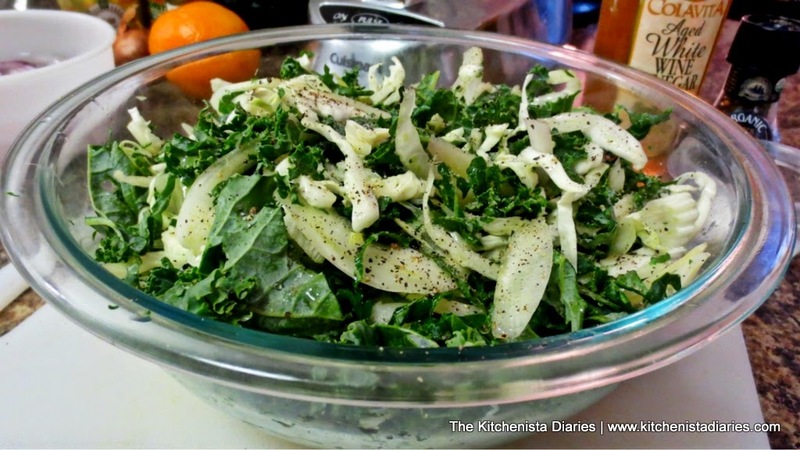 Stir the shallots and poppy seeds into the dressing; season to taste with a pinch of salt and a little black pepper. Add the onions to the kale, cabbage and fennel. 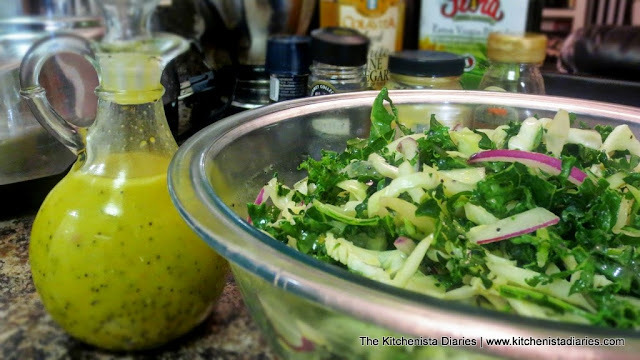 Drizzle 1/4 cup of dressing or so over the slaw and toss to lightly coat. Refrigerate until needed. I think it's best to wait at least 30 minutes in the fridge to let the flavors meld, but you could definitely make this earlier in the day too. Serve with extra dressing. Prepare to be amazed. This is a salad your whole family will enjoy. Jaden devoured it! Watching your kid eat raw kale so happily is definitely a proud Mom moment!